The best thing about Wargaming.net's World of Tanks trailers is how much personality they infuse into their steel monstrosities. In this latest, they switch between acting like loveable scamps, rutting wild animals, and, inevitably, armoured death machines raining bullets and explosives on top of each other. It's quite the juxtaposition. The stars of this show are the new recruits of the game's 8.4 update - a full branch of British Destroyers, with a couple of German and Soviet tanks thrown in for good measure. 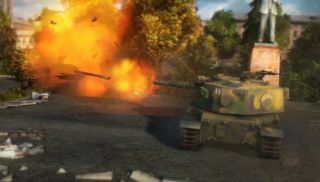 Ten new vehicles have been added, including the AT39 Tortoise, Panzer I and the huge SU-100Y. Aside from more tools to wage war, Wargaming are remodelling the areas they're fighting on. The Steppes, Fisherman's Bay, Ensk and Live Oak maps are all being updated to support the game's new visual and rendering style. The update also targets new players, with a beginner's tutorial now available. "Did you get destroyed within few seconds after the battle started because you had clearly no idea how to either move your tank or shoot at the enemy? ... We have prepared with the 8.4 version a favorable training for our youngest arrivals on battlefields." For the full list of additional tanks, head to the Wargaming's update page . The 8.4 update is out now.